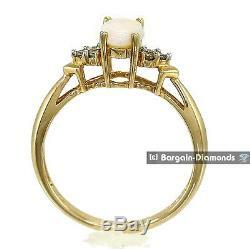 Solid Opal 6 Diamonds 14K Gold Ring Red Pink Yellow Gre en. Check Your Monitor Calibration for Accurate Image Colors! 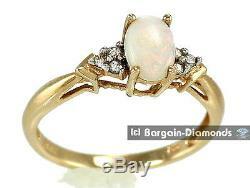 310OJ52112R Solid Opal 6 Diamonds 14K Gold Ring Red Pink Yellow Green Blue B3.5 S4-S3 N9. 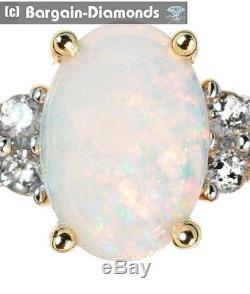 Solid Opal 6 Diamonds 14K Gold Ring Red Pink Yellow Green Blue B3.5 S4-S3 N9 DESCRIPTION. With Each Different Viewing Angle or Colors of Lighting, You will see the Pretty combination of. SOLID OPALS - natural Solid Australian Opal,'3D' Flash, 6 Diamonds, B3.5, S4-S3, N9. OPAL COLORS -'3D' Flash - Red Pink Yellow Green Blue. FLASH/PATTERN - FLOATING'3D' FLASH, Floating Colors in Natural Solid Precious Opal. B BRILLIANCE - B3.5 VERY BRIGHT Rolling, Floating'3D' P-O-C (color seen in moderate to bright light). S SATURATION - S4-S3 RICH to Medium COLOR SATURATION Intensity. SHAPE/SIZE - 7x5 mm Oval-Shaped Solid Opal. N Density - Solid White Opals, N9 Base Density with floating'3D' Color. 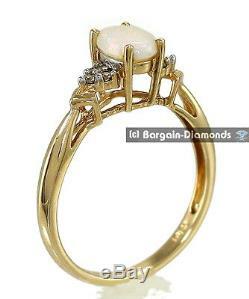 Jewelry Info - 1.40 Grams of Solid 14K Gold, Ring Size 6.75 (Sizing Service offered,). This will make HIGHLY DESIRABLE LEGACY TREASURE Opal Jewelry for Generations to come. Solid Opal (natural opal, NOT manmade), 6 natural Diamonds. Opal - AUSTRALIA, Diamonds - Africa. PLAY OF COLOR B #. B3.5 - VERY BRIGHT Floating P-O-C (color seen in moderate to brighter light). 3D' Flash - Red Pink Yellow Green Blue. S4-S3 RICH to Medium SATURATION POC. Rolling, Floating'3D' FLASH within Solid White Opal. 3D' Rolling + Floating FLASH, B3.5, S4-S3. SIZE - WEIGHT - SHAPE. Natural Solid Opal, 6 Round Faceted Diamonds. BASE DENSITY - N #. White - N9 DENSITY - Translucent. 3D' Floating/Rolling Color Flash, Many Viewing Angles. 1.40 Grams of Solid 14K Gold, Ring Size'6.75' (re-size locally for a comfort fit). Describing this Precious Opal Jewelry. The Pretty colors Flashing are simply Beautiful. Our photos were taken to depict this Solid Opal Gold Ring as you would see it, Face-Up in sunlight or bright direct household lighting. Some of the brightest Play-of-Color Flashes are oversaturated in our photos and appear as a'block' of color instead of the actual brilliant FLASH you will see. In brighter direct light, the Color Flash effect is even more brilliant than in our Photos. Our photos are magnified larger than life size to help show the colors and patterns. (25.4 mm = 1 inch) Some of the brightest Play-of-Color Flashes are oversaturated in our photos and appear as a'block' of color instead of the actual brilliant FLASH you will see. What you get are Bright, Rolling and Changing Shapes and Flashes of Beautiful Colors from a special Natural Solid White Opal Ring. Even if October and opals aren't your birthstone, everyone loves this most precious unique gemstone. Always beautiful, in other parts of the world, opals are called opalo, opaal, opale and hangende. If You see My Color Patterns Flash, You Have to Look at Our Beauty! OPAL TYPE, Origin & Location. This is natural Solid Opal Ring from Australia. A'made by God, not by Man' natural Opal, this precious Opal formed millions of years ago in pockets and seams on Australian ironstone boulders or combined with'potch' - common opal. Precious Australian Opals are cut free from the surrounding ironstone/potch, polished and trimmed to shape for jewelry use. 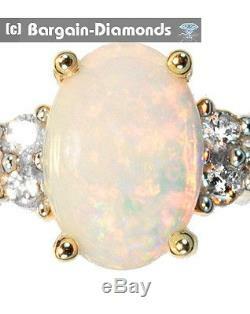 Natural Australian Solid Opals are among the best, brightest, most beautiful of all Precious Opals. Precious, natural Opals are Unique, Beautiful Creations. Demand more of your Opal Vendor than a typical GemStone Dealer! Is it a'natural' (made by God, not by man) Opal? Has the Opal been'GRADED' for "B" BRIGHTNESS? Has the Opal been'GRADED' for "N" BASE DENSITY? Has the Opal been'GRADED' for "S" COLOR SATURATION? If they claim a special pattern, coloration or characteristic, is that claim generally supported by a recognized professional opal industry association? Any decent opal can't be properly represented or appreciated on only 1 or 2 photos. Are the photos good enough to let me see the color, pattern or other characteristics claimed? BECAUSE EVERY NATURAL PRECIOUS OPAL IS UNIQUE. Insist on seeing photos of the EXACT Piece of Opal Jewelry they are trying to sell to me! MyLegacy-Treasures strives to consistently, fairly represent every item we sell. We want you to enjoy it as much in your hands as you did when you first saw it online. We grade our Opals according to the guidelines of the Premier Opal expert, Dr. Paul Downing ("Opal Identification and Value"), Australian and international opal industry associations and the GIA for gemstones. We list the most easily seen and identifiable opal valuation characteristics in our postings to help educate our clients and clearly classify each item we offer. And we use a carefully calibrated professional system of lighting, digital cameras, optics, software, video graphics card and monitor to offer photos that fairly depict each GemStone. We tend to under rather than over-emphasize our Opals so you will probably believe it is even better'in hand' than the online photos. Use the Information boxes above to get a simplified overview about this Precious Opal and its characteristics. It has detailed text descriptions to better educate yourself about the meanings of these Unique Opal GemStone terms. Photographing Opals to show their color range, intensity of color, contrast between the Opal Play-Of-Color and the base color or background color, etc. Even if the bright Opal Colors could be "accurately" captured by a camera that could see what our eyes see, the tonal range of an excellent Opal far exceeds the capabilities of our computer monitors/video cards/etc. We Try to show you the'personality & character' of every Opal we sell without artificially enhancing the contrast, tonality or color saturation beyond what you will see with similar lighting once it is in your hands. Our photos depict this gemstone as you would see it in direct sunlight or with a bright tungsten light 12"16" from the gemstone. Look at all photos of how colors'move' or appear in different places/patterns across the opal. More Red, Orange, Yellow colors in direct sun or bare tungsten bulb light. NOTE - it is nearly impossible to photograph a white or very black opal, correctly depict the opal base density and also show the beauty of the play-of-color flash on your computer screen. N9 opals are shown somewhat darker than the real opal. N1, N2 and N3 opals are shown somewhat lighter than the real opal. Opal sizes are listed in millimeters (25.4 mm = 1 inch) and Opal weights are listed in carats, just like all other gemstones and the jewelry mountings for them. OPAL BASE NAME - N# - COLOR. BASE DENSITY NAME - DESCRIPTION. Inky Black' - the Most Rare and Most Black Density. Very Black - Extremely Rare, Very Black Density. Black - Rare, a Blackish to Black Density. Greyish tones lighter than N4, Darker than N7 Density. Lighter Greyish to Off-White Density. The Opal BASE DENSITY Name is rated on a scale of N1 to N9. BLACK, Semi-BLACK/DARK, LIGHT are'densities' which may have a color cast. The Opal Base density could have a color: a neutral black or grey; blue; green; brown; yellow; orange; straw; pink/red;'pearl'; etc. So, a'black' opal is an N1 to N4 Density, but it may have a color cast and not be'black'. Opal Density Numbers or Names (BLACK, Semi-BLACK, LIGHT or WHITE) do not designate an opal's country, origin or whether it is a solid, doublet or crystal opal. PLAY OF COLOR BRILLIANCE #. The Play-of-Color Brilliance of an Opal is rated on a scale of B1 to B5. NOTE - There is NO B4.7! There are no internationally recognized grading numbers between, for example, a B4.5 and B5 grade that clearly describe what would be the difference between a B4.7 and B4.8 grade. We list a'+' to indicate an opal is better/higher than that number, a'B4.5+', and use TWO PLUSES'++' to indicate that an opal is almost but not quite the quality of the next higher grade - like a'B4.5++' being almost a B5 grade. B5 is the best possible Brilliance and is extremely rare among all opals offered on world markets with precious opal Play-Of-Color visible in low light levels - sometimes called a'night stone' or'night opal'. MyLegacy-Treasures does not sell opals with a Play-of-Color Brilliance below B3. Not Precious Opal - aka - Common Opal, Potch, Jelly, Mexican'Fire. P-O-C Only in Bright Light/Direct Sun. Fair P-O-C in Bright Light/Direct Sun, DIM P-O-C in Moderate Light. Bright in Bright/Direct Sun, V. Nice P-O-C in Moderate, Fair in Lower Light. Bright in Bright/Direct Sun, Bright P-O-C in Moderate, V. Brilliant in Bright Light/Sun, Crisp/Saturated Color in Moderate, Good in Lower Light. Good in Lower Light, Exceptional in all other lighting, (slightly lower than B5). Exceptional Bright, Crisp, Saturated Color in all lighting (color visible in low light). COLORS SEEN IN THE PLAY-OF-COLOR. Red is generally considered the most valuable of all Opal Play-of-Color. Greens - Blues are the most common of all Opal Play-of-Color. Less common colors can be any color of the visible spectrum from Violet, Purple, Royal Blue to Cherry Red, Flame Colors, Magentas, Pinks, Oranges, Golden Yellows, Peacock Green, Fuchsia, Lilac, Salmon, etc. What colors are seen, in what shape or pattern and from which viewing angles depends, in part, upon the viewing light used. The best light source for viewing a precious opal gemstone is one that does not change. We recommend direct sunlight or 12" to 16" from a bright tungsten lightbulb. Your opal will look different in different kinds of lighting. Sunlight and tungsten bulb lighting will tend to bring out more warm tone colors - reds, oranges, yellows, magentas and purples. Fluorescent lights, LED flashlights and light filtered through a diffuser is not satisfactory. Color Saturation, the richness, purity or depth of color, is an important factor in the pricing of opals but less so in the enjoyment of them. 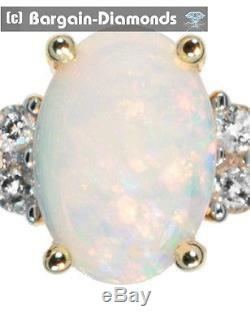 You will probably find that you enjoy the beauty of an opal with a pale or pastel color saturation. And you might enjoy some bright, rich color saturation levels in a different Precious Opal. We list Color Saturation of an Opal as - PALE, PASTEL, MEDIUM, RICH and VIBRANT/MIRROR as appropriate. A Natural Precious Opal may have more than one S#, meaning that it may have, for example, S5-S4 Saturation - Vibrant to Rich levels of Color Saturation. S# COLOR SATURATION TABLE DESCRIPTION. Colors are pale - highly diluted by white, grey, black. May need bright light to best view. Often highly desired for fashion. May be desired for fashion. RICH, PURE, fully saturated colors. Exceptional VIBRANT, Saturated Color in all lighting (like a Mirror of colored glass). PLAY-OF-COLOR FLASHes, SHAPES & PATTERNS. See our written description below the photos for more information about special Opal Play-of-Color Flashes, Shapes and Patterns of this Opal. Harlequin is a name originally reserved for a very rare pattern of squares or diamond shape play-of-color that looked like a chess board. Harlequin' is now used by opal vendors worldwide to encompass many of the rare and unusual natural precious opal play-of-color patterns that are easily identified - Floral, Flag/Flagstone, Chinese Writing, Ribbon, Rainbow, etc. Every natural Opal gemstone is unique. Our photos probably will only capture some of the play-of-color, patterns and coverage across the entire face of the opal gemstone. You may have to rotate or pivot the gemstone and/or change positions between you, the opal and the viewing light to see play-of-color from a particular area of that gemstone. The very best opals have play-of-color across the entire gemstone. Most precious opals do not have play-of-color across 100% of the gem and are beautiful. Some precious opals have a mirror flash, a Harlequin or other unusual pattern, ribbons of color or many variations that are both beautiful and stunning while not covering 100% of the opal's face. We list if the opal has 100% play-of-color coverage because this is more costly. The most expensive opals have at least some wonderful Play-of-Color from every viewing angle. Sometimes an opal is at its best if lighted from the side or from slightly'above' which would make it an ideal opal to use for a pendant. Some opals are at their best and brightest'face up' - when the viewer has the light source over her shoulder to view the opal face-on like a ring stone. Opals with patterns, Harlequin, chinese writing, mirror flashes, rolling flashfire, pinfire, etc. Usually display the best of their beauty from certain directional viewing angles. This can result in a sudden "SHOCK" of color or pattern that splashes forth to delight your eyes. If an opal is highly directional or has particular beauty in our photos from specific directional viewing, we will list it as'directional' in our description. It has detailed text descriptions in to educate yourself about the meanings of these terms. The item "Solid opal diamond 14K gold ring Australian red pink yellow green engagement" is in sale since Wednesday, September 9, 2009. This item is in the category "Jewelry & Watches\Fine Jewelry\Fine Rings\Gemstone". The seller is "bargain-diamond" and is located in Norcross, Georgia. Sizing Fee: +/-2 Sizes for $25.